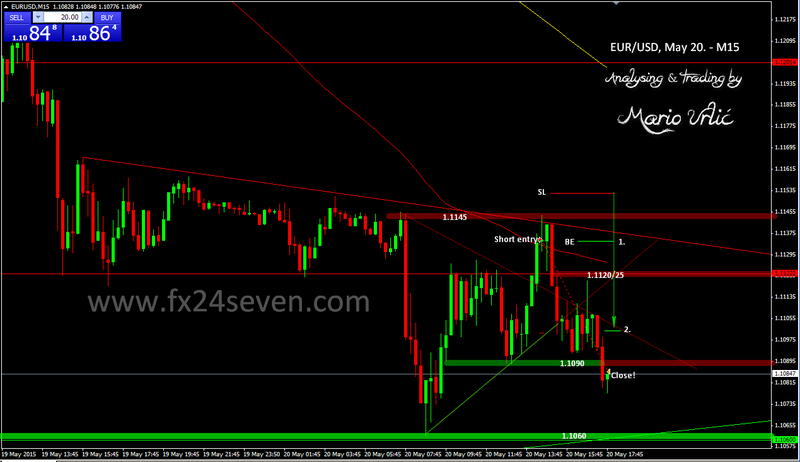 EUR/USD is still bearish, but I decided to close my short at 1.1085! I took 50 pips in this short and that’s exactly how much I will risk in my setup from this morning. Why I close this short here? Well, as I wrote this morning, this is the buyers teritory here at aprox 1.1060 and, as you can see, I moved my SL lower where my position was in danger to close it with much less gain. 50 pips is enough for me, let’s wait FOMC now! 1.1090 could be resistance here, but it’s not strong and bulls could take over that level again to 1.1120/25. FOMC minutes are in about two hours, I will take a brake until then. Just to add one more thing. During my trade I was following other pairs with US dollar and I felt that the US Dollar is slowly losing strength. That’s another reason, why I decided to close this short here. It’s not all about technical levels.